(SitNews) Ketchikan, Alaska - As an ardent consumer of the news, I was somewhat taken aback by the complete lack of media coverage over whether or not Alaska’s marmot saw its shadow on February 2. About all I found was an article in the Juneau Empire about the natural history of the marmot (also called the woodchuck and the groundhog). But no details about our upcoming weather, unfortunately. As you all know, our former Governor – Sarah Palin Superstar – declared February 2 to officially be Alaska Marmot Day in 2009. No more being concerned with Punxsutawney Phil or Buckeye Chuck or Grady the Groundhog for us. We would now have our own hairy rodent-like creature to drag out of its den, expose to camera flashes, and then stuff back in the ground to “enjoy” the rest of its hibernation. Yet, sadly, we Alaskans apparently decided to let sleeping “land beavers” lie this year. 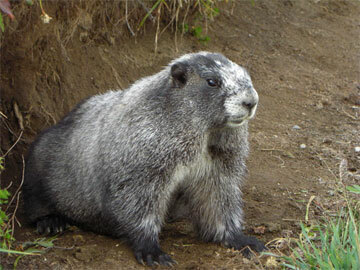 There were no recorded instances of meteorological prognostication from our marmots. We have no idea whether or not we are going to have six more weeks of winter. Naturally, I had to dig deeper into the subject. So I paid a visit to one of our local “whistle pigs.” Cholmondeley Marmota Monax. Chomly (as he his known to his friends) asked that I not divulge the location of his “Mam” cave. Chomly has a spacious “mam” cave indeed. With all the accoutrements of a modern bachelor, including flat screen TV, barcalounger, waterbed, Wi-Fi, and Playstation. Chomly was getting ready for a Super Bowl Party when I met with him. He conceded he wasn’t much of a football fan. But what I was really interested in was the future weather. In other parts of the country, folks breathlessly wait to find out whether a groundhog/woodchuck/marmot will see his or her shadow. If so, it means another six weeks of winter. He had a point. I’m not sure that even the Farmer’s Almanac could come up with a “folksy” enough explanation for why a woodchuck shadow would mean more winter. Fair enough, but did he see his shadow on Feb. 2? But did he see his shadow? But when pressed for a prediction, he sighed. Straight from the Marmot’s Mouth.